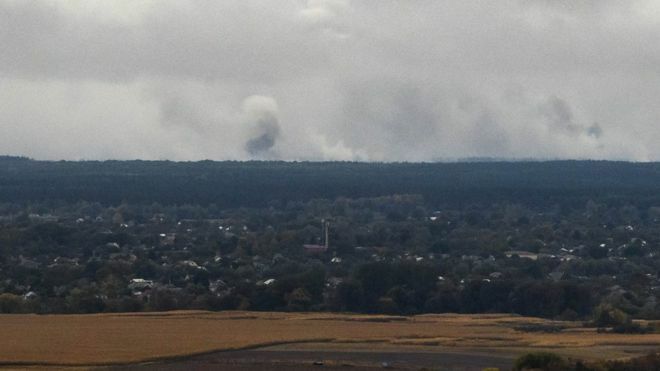 Explosions and fire have hit an ammunition depot in Ukraine in a possible act of sabotage, officials say, leading to the evacuation of thousands of people. Around 10,000 people were moved from the area around the depot, about 109 miles (176km) north-east of the capital Kiev, emergency services say. �The intensity of the blasts suggests that it was most probably sabotage,� he said. The initial explosion at the base occurred at around 03:30 local time (00:30 GMT). Moscow denies sending troops and weapons to help separatists in the conflict, but admits that Russian �volunteers� are helping the rebels.